Kerala Tourism of India is looking for thirty bloggers worldwide to participate in a two – week travel free trip to Kerala, India including visa expenses. If you are thinking this is too good to be true, for my fellow Filipino bloggers this is actually already on its third year. The past years Pinoy travel bloggers who made it are Ivan Henares of Ivan About Town, Edgar Allan Zeta – Yap of Eazy Traveler , Gael Hilotin of The Pinay Solo Backpacker and a few more I cannot remember. As of now there are 8 bloggers shortlisted so they still need 22 more! All you got to do is fill up the registration form with your blog’s details then it be reviewed by a panel. If they find you suit the qualifications of the kind of blogger they need, your profile will appear in the official page which you can share to friends and followers for voting. 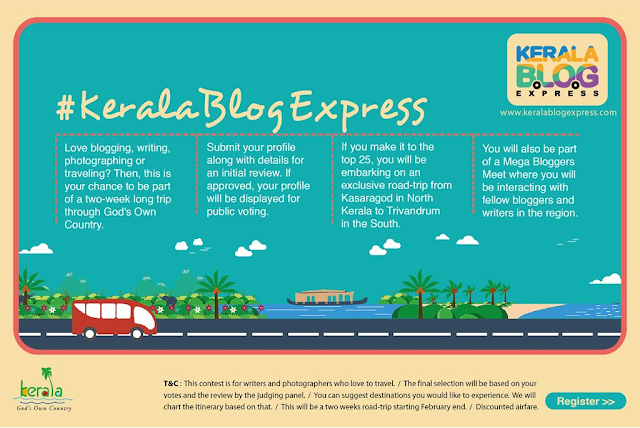 Obviously once chosen you have to blog about your experiences during the Kerala Blog Express and promote in social media as well. I have not seen any info about the deadline of the contest on their website. They will provide the food and have you stay in top notch hotels and resorts in Kerala during the trip. You will need to book your trip first then they will reimburse 70% or USD1000 whichever is cheaper on your flight. Click here for the complete details about the Kerala Blog Express Contest For Win A Trip to India.